Stephen Bartholomew Photography | Dear Diary 3rd September - “But Someone Has To Do It Tour”. Dear Diary 3rd September - “But Someone Has To Do It Tour”. Dear Diary 3rd September - “But Someone Has To Do It Tour”. Burghley to Blair, my daily diary of two weeks of top end equestrian sport from behind the lens. Early start 5:30 this morning to try and get a picture of sunrise over Burghley House, plan failed miserably due to 8/8th cloud cover. First day of dressage gave some good pictures, but very overcast and cold all day. I learnt a long time ago it is very easy to get carried away and shoot 100’s of frames per test, which leaves you with 100’s of images to edit. So the approach for editorial use is take only the elements of the test that look like dressage movements and then just a few frames of each rider. I ended up wiring as many images but a lot quicker. Michael Jung [34.2], Andrew Hoy [37.8] turned in tests that were noticeably on another level and together with Niklas Bschorerand [40.2] fill the top three slots on the leaderboard after day one. Walked the Leaf Pit area, Discovery Valley, Trout Hatchery just after lunch and the the word “BIG” seems to be the word in every conversation. The XC photographic plan for Saturday is now coming together along with a couple of alternatives, but it is all weather dependant and Friday and Saturday’s forecast looks very much the same as today. Sophie Jenman goes in the first session at 10:10 and the following three sessions have a number of the big names. Picture : Michael Jung at the end of day press conference. 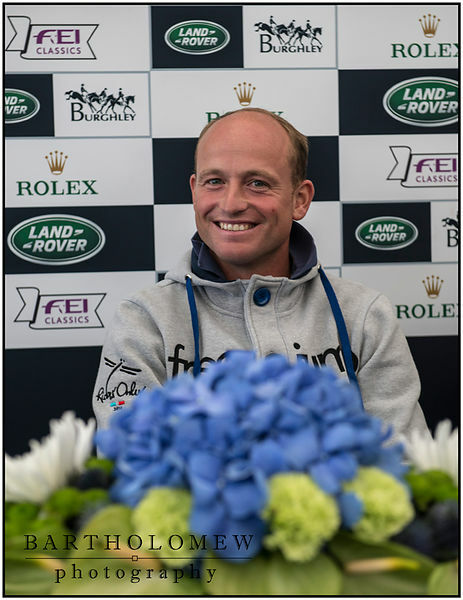 The guy maybe at his first Burghley but he knows how to manage a press conference.